On this 2 to 2.5 hour semi-private (8 Guest Maximum) guided museum tour visit one of the world’s largest collections of artifacts at the British Museum. Your engaging tour guide will take you through a curated selection of cultural and artistic works, sharing the history that will help you understand and appreciate a small portion of the 8 million items at the British Museum. - Minimum numbers apply. This tour will not run without a minimum of 2 guests to meet requirements. In the event of this occurring, you will be offered an alternative or full refund. - Notes: British Museum and other attractions or museums in London may be subjected to occasional closures without previous warning from the museum management. When this occurs, we will provide guests with an appropriate alternative if the museum opening time is delayed more than 1h from the tour starting time. In these cases we are unable to provide refunds or discounts. Appropriate dress is required for entry into some sites on this tour. No large bags or suitcases are allowed inside the museum, only handbags or small thin bag packs are allowed through security. Due to increased security measures at many attractions some lines may form on tours with 'Skip the Line' or 'No Wait' access. Some specific rooms inside the museum are subjected to a very quiet or restricted right to speak inside, in this cases your guide will provide the information about this places before entering the specific rooms where this rule applies. Some collections may vary along the year. 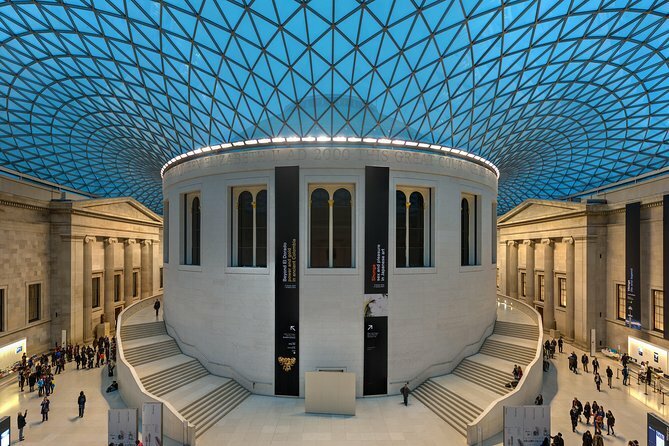 Trade in paintings for mummies and historical artifacts on a tour of the British Museum. The enormous collection spans 6000 years of human history, featuring items from all over the world like Samurai armor and rare Assyrian lion hunt reliefs. Your guide will take a serious but enjoyable approach towards the museum’s galleries, discussing primitive tribes and fallen empires through a carefully chosen selection of items. You’ll learn about the Mummy of Katebet, the Lewis Chessmen, and the Rosetta Stone – the actual rock, not the language learning program. Walk away with an understanding of what we humans have achieved during our short history and hopefully you’ll be proud to call yourself a part of this incredible species.